At first glance, the ancient Babylonian tablets on exhibit for the first time at a Jerusalem museum look like nothing more than pockmarked lumps of clay. But the 2,500-year-old treasures from present-day Iraq have become part of a thorny archaeological debate over how to handle historically significant relics thought to have been dug up in the fog of war by Mideast antiquities robbers. Experts in cuneiform writing, one of the world's earliest scripts, say the collection of 110 cracker-sized clay tablets provides the earliest written evidence of the Biblical exile of the Judeans in what is now southern Iraq, offering new insight into a formative period of early Judaism. The tablets, though, also tell a murkier story, from the present era, according to scholars familiar with the antiquities trade—a story of the chaos in Iraq and Syria that has led to rampant pilfering of rich archaeological heritage and a rush of cuneiform tablets on the international antiquities' market. The collector who owns the tablets on display this month at the Bible Lands Museum Jerusalem, insists they were purchased legally, decades before that looting began. However, an ancient history scholar familiar with the artifacts disputes that. Leading U.S. museums have pledged not to exhibit unprovenanced artifacts that have surfaced in recent decades, as part of an effort over the last decade to discourage illicit antiquities trafficking. But cuneiform inscriptions have emerged as a notable exception, with some arguing these relics would be lost to history if they did not make it into scholarly hands. "We are not interested in anything that is illegally acquired or sneaked out," said Amanda Weiss, director of the Bible Lands Museum Jerusalem. "But it is the role of a museum to protect these pieces," she added. "It's what we are here for." The plundering of antiquities in the war-torn Middle East has become a primary concern for the archaeological community, and some archaeologists even compare satellite images of sites in Iraq and Syria to moonscapes, after antiquities robbers went through them. Archaeologists claim the Islamic State extremists and militants from other groups are funding their activities in part through illegal trafficking of antiquities, and authorities worldwide have been taking action to try to stem the flow. What first sparked awareness of the issue, archaeologists say, was a deluge of cuneiform artifacts on the Western antiquities markets after the first Gulf War in 1991. In the years that followed, archaeologists estimate that hundreds of thousands of small clay tablets with cuneiform inscriptions made their way into the hands of dealers. Many contained incrustations, indicating they were "fresh out of the earth," said Robert Englund of the Cuneiform Digital Library Initiative. An American scholar of ancient Jewish history familiar with the tablets on display in Jerusalem said they were purchased on the London antiquities market at the time when cuneiform artifacts were flooding the market, a strong indication that the items were looted. He spoke on condition of anonymity to discuss a potentially illegal activity. London-based Israeli collector David Sofer, who loaned the cuneiform collection to the Bible Lands Museum, denied any foul play. He said he purchased the tablets in the United States in the 1990s from a person who obtained them in public auctions in the 1970s. Sofer said a few tablets from the collection were displayed in a New York museum and a Los Angeles museum in 2013, and their import and export in the U.S. was properly reported to U.S. authorities. He would not name the two museums, or the person who sold them to him. "These things would be lost, and wouldn't be recognized for what they are" if he hadn't bought them, Sofer said. As common as cuneiform tablets are, few have been as celebrated as those on display in Jerusalem. 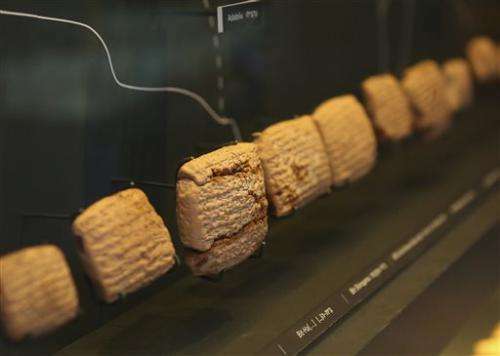 The tablets fill in a 130-year gap in the history of the Judeans exiled to Babylon after the Babylonian destruction of Jerusalem in the 6th century B.C., said Laurie Pearce, a cuneiform expert from the University of California, Berkeley. The earliest of the tablets, which have dates inscribed on them, is from just 15 years after the destruction of the First Jewish Temple in Jerusalem, and the inscription suggests the displaced Judeans were more quickly absorbed into the Babylonian society than previously thought, said Pearce, who studied the collection. The tablets include administrative documents such as land agreements, showing the Judeans were "integrated almost immediately," she added. 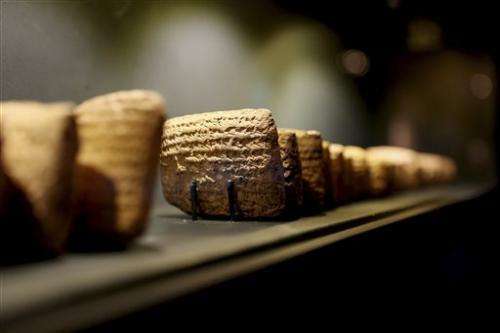 The Jerusalem museum says the tablets likely originate in today's southern Iraq, and reference common Judean names, including Netanyahu, the last name of Israeli Prime Minister Benjamin Netanyahu. The topic of cuneiform artifacts still roils the archaeological community. The American Schools of Oriental Research, an academic research association, bans scholars from publishing articles on artifacts illegally excavated or exported from their country of origin after 1970, when the U.N. adopted its policy against antiquities trafficking. But in 2004, the association made an exception, allowing publications about cuneiform artifacts that have no record of how they were unearthed—under the condition that Iraqi antiquities authorities give their consent and that the artifacts are eventually returned to Iraq. The exception was made because the esoteric wedge script writings are so valuable to historical study, said Eric Meyers of the association. The policy is now again a point of contention in the field. Over the past year, scholars at the association have debated changing the policy again, with most experts leaning against publishing articles on cuneiform artifacts as these objects continue to hit the markets, Meyers said. "It is a crisis in the region," he said. Hard choice. Lose the history for bureaucracy or support an illicit activity that undoubtedly has catastrophic effects on the archaeological process. Once their authenticity is verified perhaps an investigation to follow the chain back to the source. Funny. Plenty of tablets from civilizations throughout the region, all describing interaction with each other. But absolutely nothing from the great davidic/Solomonic kingdoms. No ruins, no roads, no evidence whatsoever FOR these kingdoms but a great deal which says that their existence was impossible. So either god does not know history or he actively obliterates evidence and replaces it with completely convincing counter evidence. Either way he is a deceiver. Why does he LIE to us to find out how much we TRUST him? As regards destruction of fragile artifacts I do see that that not only God is capable of that as evinced by the article. Also you do realize that to claim there is no evidence one would merely need to find one piece of evidence to contradict such a statement. Ie: the Cyrus cylinder. The statement that there is no evidence of a kingdom of Israel is not legitimate if but one piece is found. You'd think after so much grinding we'd begin to see some kind of edge on that axe, eh Otto? So what, God fabricated these tablets just to confound your pet theory? My theory is that you're not a proper anthropologist at all. I bet you don't even have a proper anthropologist's hat (baseball caps don't count). I can't recall them all but I do specifically recall that there was more than one piece of evidence. Religionists like yourself would use tablets like these as evidence for the kingdoms. But the kingdoms never existed. The above article says they are from 15 years after the destruction of the first temple but there is no real evidence to indicate that this temple ever existed. See how religionists fabricate? We have clay tablets of unknown origin and dubious authenticity; therefore the kingdoms and the first temple both existed. This sort of lying is encouraged in a book which is based on fairy tales. My axe-grinding is against books which claim to be the source of morality but are full of disproven lies. Why wouldn't this piss off any decent, honest individual? No I'm not a 'proper anthropologist' but I know where to find them which is all that matters. And unlike you I do know that people like Kent Hovind are not 'proper anthropologists'. THE POINT IS that anthropologists have been digging in the Middle East for a century and they have indeed found a great deal of evidence which indicates that the bible stories were all impossible. Not only is there no evidence FOR, but an overwhelming amount of evidence AGAINST. It is one thing to make a kingdom disappear, but quite another to make it look as if it never existed. And no discovery of fake cylinders or stone boxes or dirty shrouds could alter this conclusion. A god who would go to such great lengths as to so thoroughly obscure the existence of an entire people for a millenium, not to mention creation, the first people, and the flood, and THEN to require belief in them as the only way of escaping eternal torture, is a very evil god indeed. Unfortunately, looted artifacts is providing ISIL with a decent funding stream. Collectors are helping to promote terrorism.